Other than for DC power supply applications where you might need to implement current steering and/or redundancy schemes, there are not too many times when a combination of transistors and/or diodes would be used for logic circuitry in place of integrated circuits. That has not always been the case. 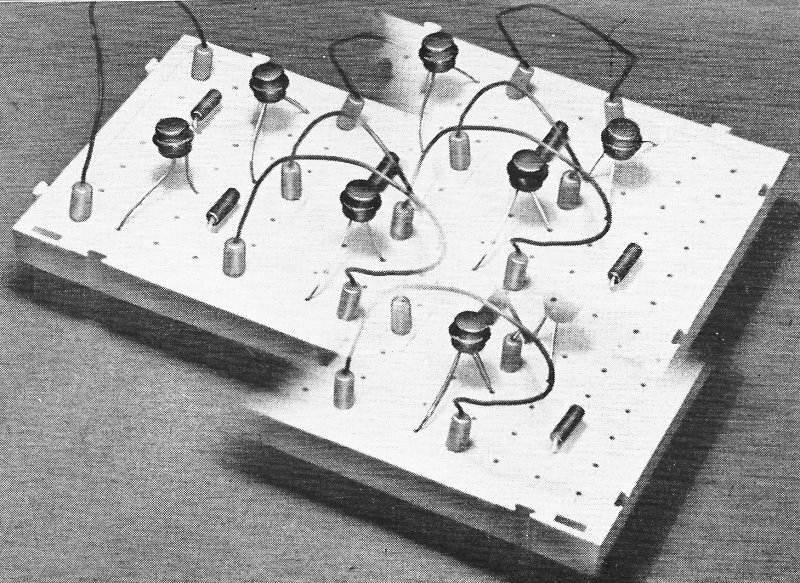 Early packaged IC blocks were expensive compared to discrete components, so both hobbyists and professional designers often used a combination of technologies. 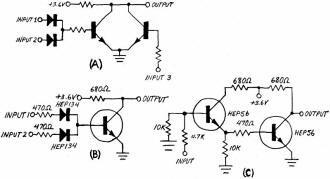 Resistor-transistor logic (RTL) and diode-transistor logic (DTL), emitter-coupled, logic (ECL), and other variations were covered in a 1969 Radio-Electronics article by titled "How IC's Work: Integrated Circuit Logic Families." This piece provides a little more insight into the construction of those families and shows how to construct logical combinations using diodes and NOR gates. As noted in my Radio-Electronics write-up, the Apollo Guidance Computer used only 3-input NOR gates to build RTL circuits for all of its solid state logic capability. Virtually all RTL (resistor-transistor-logic) integrated circuits can be duplicated from conventional discrete components. This enables the builder to design and test circuits at the same time - well before an IC is selected and installed. 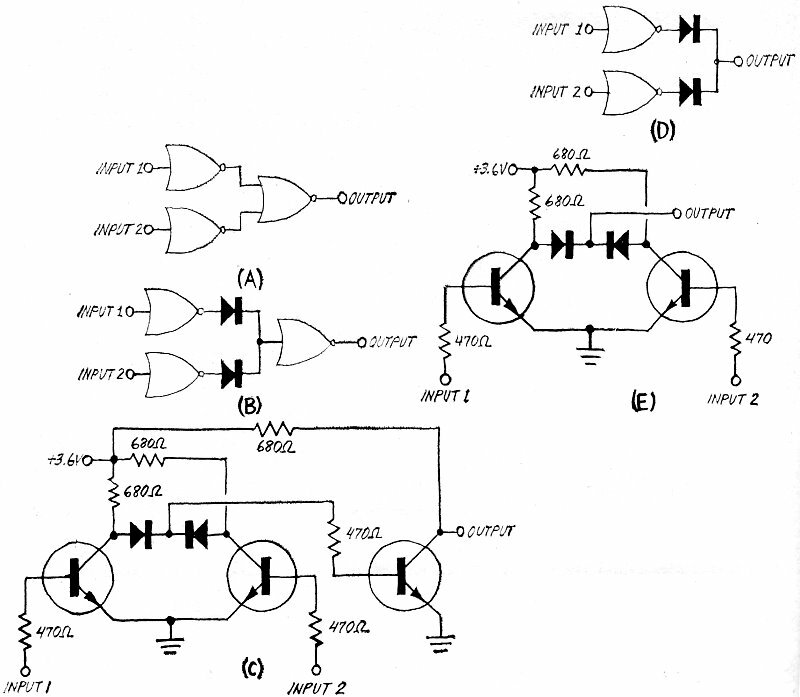 Various logic gates, latch circuits, and half-adders are discussed in this part of the article. The integrated circuit has been with us for barely a decade and in use in hobbyist and experimenter circles for roughly half that time. Yet, the IC has had a profound effect on every area of electronics, making possible the present sophistication of modern digital equipment. The digital computer, for example, is often viewed erroneously as a complex device of gigantic proportions. But you have only to consider how much more complex and larger in size it would have to be if it were assembled entirely with discrete components. Without the IC, a digital computer could easily occupy the volume of a small house. What is true of the digital computer is also true of all digital logic devices, including communication, telemetry, and instrumentation systems, as well as the digital test equipment many home enthusiasts use on their workbenches. Without integrated circuits to simplify and miniaturize electronic devices, our space program would still be where it was ten years ago, information processing would be slow and tedious, and it is more than likely that digital test equipment would never have evolved. Fig. 1 - N-input integrated circuit gate. The purpose of this article is to provide information needed to breadboard IC logic element equivalents, or near equivalents. "Equivalent" - as used here - refers to the function and not the configuration of the IC and discrete circuits. In this first of a two-part story on resistor-transistor logic (RTL), attention is focused on logic gates. (The glossary explains the distinction between the three fundamental types of digital logic systems - RTL, DTL, and TTL - and provides definitions for the various technical terms used in this article.) Installment number two will deal with the more sophisticated toggled logic circuits, including the JK flip-flop. Virtually every RTL element consists of some form of logic gate which operates in much the same manner as a common relay. The gate requires an input activating force and a two-state (on/off, high/low, or logic 1/logic 0) output. Only two output states arc necessary for digital circuits to communicate in their two-digit, or binary arithmetic, language. Consequently, the basic elements of digital systems are quite simple. Compared to the 0-to-9 decimal system of arithmetic, however, binary arithmetic requires a tedious number of operations to perform the same function and process the same information. The extra operations, of course, require extra logic elements which, in turn, give all digital equipment the appearance of being complex. The transistors in all RTL integrated circuits are silicon NPN types with characteristics similar to discrete computer-type switching transistors. All RTL IC's operate from a power source of 3.6 volts within a maximum tolerance of ten percent. When breadboarding any RTL element, keep in mind that a computer-type transistor need not have a linear transfer characteristic since it is never operated in a linear fashion. It is either completely cut off or fully saturated. However, it must have certain other characteristics: excellent high-frequency response; comparatively high saturation current gain; and 0.2 volt or less collector-to-emitter saturation potential. The latter is important because when the output of one gate is connected directly to the input of another gate, the output potential of the first transistor, when saturated, is sufficiently near ground potential to insure that the second transistor is fully cutoff. A one-input gate is most commonly referred to as an inverter because its output is 180° out of phase with its input. In terms of positive computer logic, when the input is at a logic 1, the output is at a logic 0, and vice versa (logic 1 is the complement of logic 0). In terms of negative computer logic, the 0's and 1's change places for the on or off state of a given transistor. It is simpler to follow positive computer logic where a logic 0 is equal to ground or near ground potential because the logic designation coincides with the signal level. As far as logic is concerned, however, it makes no difference whether logic 0 is represented by a near-ground potential or by some potential significantly removed from ground. If you think of a logic 0 as represented by a cut off transistor, and a logic 1 as represented by a saturated transistor, then negative logic can be followed as easily as can positive logic. Fig. 2 - N-input discrete-component logic gate. The schematic diagram of Fig. 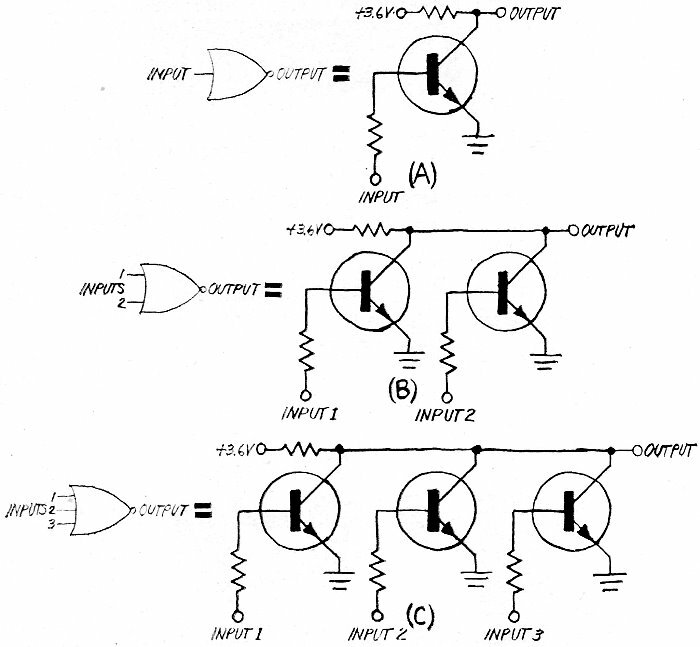 1 shows how simple it is to provide additional inputs to the logic gate. The collector load resistor remains the same for each additional input stage. Theoretically, at least, IC designers could go on adding inputs in this fashion until the total accumulated leakage current became excessive. In easily available IC's, four inputs - in a quad arrangement - are the most you can get. Within reasonable limits, adding inputs has no significant effect on the fan-in and fan-out factors of a gate. Figure 2 shows how you can breadboard logic gates with discrete components. Readily available resistor values are somewhat greater than those conventionally used in integrated circuits, but they are close enough for the most part - especially if you do not attempt to work your discrete-component setups close to maximum fan-out. But when working with critical circuits, you shouldn't load your circuits too heavily in any case. Almost any high-speed, computer-type silicon NPN switching transistor can be used in your circuit setups. A good example of such a transistor is the 2N2475 and HEP56. If you are in an area where surplus parts stores are located, you might be able to pick up quite an assortment of silicon switching transistors at bargain prices. In the absence of computer-grade transistors, you might try using any high-frequency silicon NPN transistors you have around. But remember to run the input up to where the transistor is well into saturation, and check the collector-to-emitter potential with a meter. If the reading obtained is 0.2 volt or less, chances are you can use the transistor in digital logic-gate service. Being able to expand a gate is particularly useful when circuits are being assembled on your workbench. The circuit in Fig. 3A is an expander, resembling an inverter or one-input gate with the exception that it has no collector load resistor. Figure 3B shows how all expander can be added to an IC inverter element to make a two-input logic gate. Simply connect the collector (output) of the expander circuit to the output of the inverter. The input to the inverter now becomes input 1 and the input to the expander becomes input 2. Note that the circuit is fundamentally identical to that in Fig. 1. In a similar manner, you can add all expander to a two-input gate to create a three-input gate, and so on. Fig. 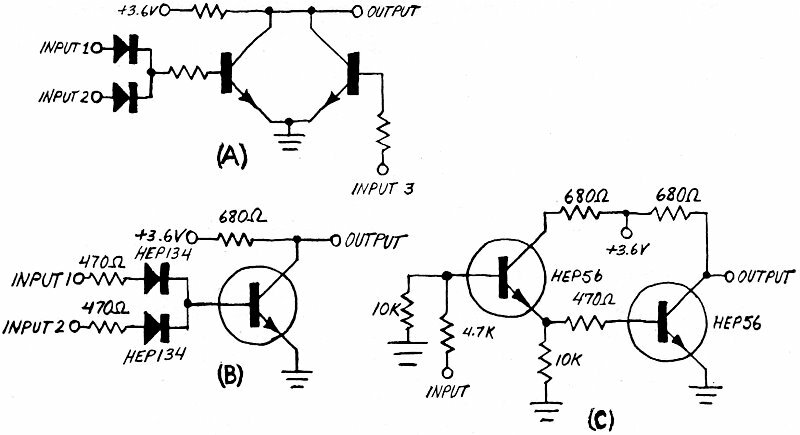 3 - Simple expander (A) adds inputs to gate (B). Now, suppose you have a two-input-gate IC, you need a three-input gate, and you have no suitable transistor on hand to breadboard the expander. 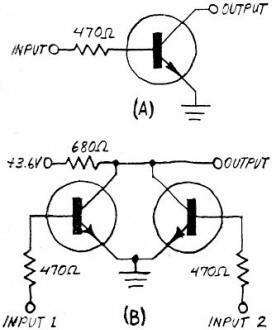 You can expand the two-input gate to a three-input gate by using a couple of germanium diodes as shown in Fig. 4A. The diodes can be 1N191 or HEP134 types - or any diode with similar characteristics. The purpose of the diodes is to keep a logic signal at input 1 from entering input 2 and vice versa. Yet each diode allows the signal at its respective input to enter the IC left-gate input. (Note: Discrete and IC configurations can be identified by whether or not a circle encloses the transistors. Discrete transistors are enclosed in circles, while IC transistors are not.) 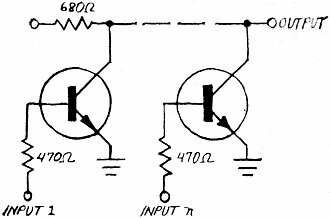 If you need a four-input gate, you can add a similar pair of diodes in the same manner to the input resistor on the second transistor. There can be a 0.3-0.4-volt forward voltage drop across each diode, so it is not advisable to use diode expansion as part of the load in a maximum fan-out configuration. The transistor expander in Fig. 3A is not subject to this limitation. On the other hand, if you are breadboarding a two-input gate using a pair of germanium diodes and a single transistor, as shown in Fig. 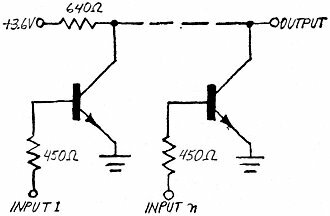 4B, you can often get around the voltage-drop limitation by using a germanium NPN transistor (HEP641 or similar) in the setup. However, there are significant factors that must be taken into consideration here. First, germanium transistors can be operated in no more than a moderate temperature environment since they perform poorly or not at all at elevated temperatures. (The same, of course, applies to germanium diodes.) Second, the lower the required logic level, the lower the noise immunity of the circuit. For those setups where noise pulses or spurious signals are a particular problem, the circuit in Fig. 4C can be of considerable value. This circuit gates with an input logic level of 3 volts but is unresponsive to input signals of 1.5 volts or less. Additionally, its fan-in is only about ten percent that of a gate with a conventional input. From now on, logic symbols will be used in many of the schematic diagrams in this article. The logic symbols, with their equivalent electronic circuits, are given in Fig. 5. Fig. 4 - Germanium diodes are often used to add inputs to existing gates (A) and (B). Typical noise immunity circuit (C) is below. Fig. 5 - Logic symbols (at left of each circuit) are generally used in logic flow diagrams. Fig. 6 - Diode pair can be used to make AND gate in (A) from three inverters as in (B). Discrete-component diagram for (B) is shown in (C); (D) and (E) are logic and schematic diagrams for NAND gate. A positive-logic NOR gate is a negative-logic NAND gate. 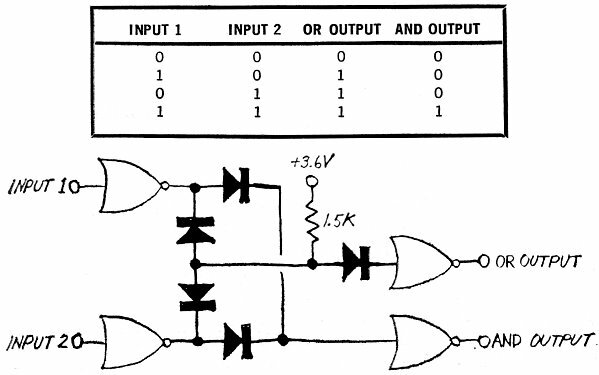 From the point of view of positive logic, the gates described thus far are all NOR gates in which a logic 1 input to either input 1 or input 2 (or both) produces a logic 0 output. The circuit in Fig. 6A is a conventional positive-logic two-input AND gate wherein both inputs must be supplied with a logic 1 signal to generate a logic 1 signal at the output. This setup requires two inverters and a two-input gate to bring the input and output signals into phase with each other. The small circles at the apices of the logic symbols indicate inversion, or a 180° phase displacement, between the input and output signals. Hence, two gates or inverters are needed to make the output and input signals of the same phase. If you have only three inverters and no two-input gate available, you can breadboard a positive-logic AND gate with the aid of a pair of germanium diodes as shown in Fig. 6B. An AND gate, assembled with discrete components is given in Fig. 6C. An AND gate requires two inversions so that logic 1 inputs provide a logic 1 output. Without the second inversion, we would have a NAND gate. In the NAND circuit, logic 1 inputs provide a logic 0 output. Given in Fig. 6D and in Fig. 6E are the logic diagram and discrete component schematic diagram for NAND gates. In comparing the AND and NAND gates, note that a double inversion is equal to no inversion at all. In the preceding logic-gate circuits, output logic directly follows input logic. In the simple two-input gate, for example, a logic 1 at either of the two inputs produces a logic 0 output. Removal of the logic 1 input by sending the input to logic 0 produces a logic 1 output. There are, however, applications where it is desirable to turn on one gate by applying a signal to one input and turn oft the gate by applying a signal to the other input. Once such a circuit is energized, it will remain turned on even after the excitation signal is removed. It will also be unresponsive to succeeding turn-on signals. Similarly, once it is turned off, it will remain off and be unresponsive to subsequent turn-off signals. Such a device can be thought of as it "latch" and is known as an RS (for reset-set) flip-flop. The fundamental circuit of a latch ran be represented by a pair of inverters, with the output of one inverter connected directly to the input of the other as shown in Fig. 7 A. Because inversion occurs in each inverter, it is obvious that when one side of the circuit is on, the other must be cut off. It is equally obvious that the on side must remain on and the off side remain off unless something is done to make the system change states. 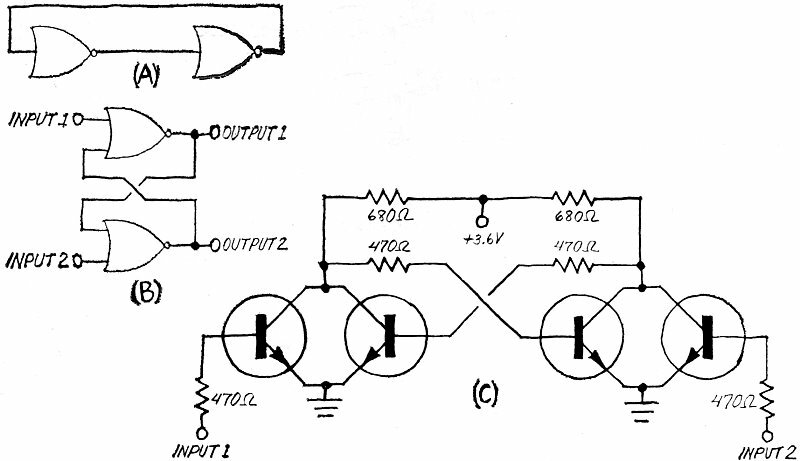 No provision is made to effect any such control in the simple circuit shown. A more practical latch or R.S flip-flop is shown in Fig. 7B. 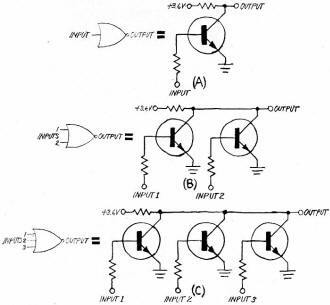 Here a pair of two-input logic gates is used. One input of each is used for the feedback, and the other is used for control. A logic 1 signal applied to input 1 sends output 1 to logic 0 and output 2 to logic 1. The circuit then remains in this state - held there by its own feedback and disregarding any further application or removal of turn-on signals - until a logic 1 signal is applied to input 2, at which time the output logic reverses itself. Only a brief pulse at the proper input terminal is needed to trigger and latch the circuit in either state. The waveform of the control pulse is not especially critical. In fact, an RS flip-flop is often used to "shape" a logic pulse by converting it to a square wave with very steep sides. If a logic 1 signal is applied to both latch inputs simultaneously, both outputs will go to logic 0. The final state of the latch will then depend on which of the two inputs is the last to be removed. Ordinarily, a latch is not operated in this mode; but if a particular setup calls for such operation, there is no reason why it cannot be employed. The circuit in Fig. 7B is given in discrete-component form in Fig. 7C. Depending on what components you have available, you can breadboard a latch in several different ways. It can consist of a dual two-input gate IC, a pair of inverters in an IC (plus a couple of expanders), or four individual transistors if necessary. Fig. 7 - Two inverters are employed in fundamental latch circuit (A). More practical latch is RS ftip-flop illustrated in diagrams in (B) and (C). Fig. 8 - Practical latch using inverters is illustrated in diagram (A); discrete-component circuit for power-gated, or buffered-input, latch is shown in schematic diagram (B). Fig. 9 - Simultaneous AND/OR gate at left employs diodes and simple inverters. All possible inputs and their outputs are listed in truth table (above). Fig. 10 - Simple addition of diode D and resistor R to the simultaneous AND/OR gate yields the Exclusive OR circuit that is shown at right. Fig. 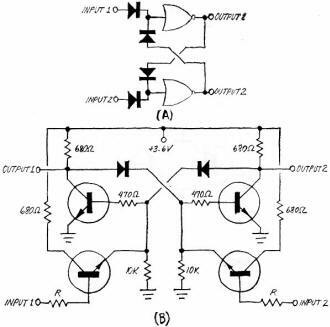 11 - Half-adder/subtracter has DIFFERENCE and BORROW outputs in addition to the SUM and CARRY of Exclusive OR. If you need a latch circuit and have only a single pair of computer-type silicon NPN transistors, or a couple of spare inverters in a hex-inverter IC, you can assemble the fundamental latch circuit in Fig. 7B and gate or trigger it from one state to the other with germanium diodes. The circuit in Fig. 8A illustrates how this can be done. It is possible to do this for the same reason that it is possible to use a pair of diodes for gate expansion, in which the two diodes on each side of the setup operate as positive-logic OR gates. In the circuit of Fig. 7B, turn-on of a transistor is accomplished by pulling its collector down to near ground potential. It then turns on as a result of cross-coupling. In the circuit of Fig. 8A, the same result is obtained by driving the base positive with a logic 1 input. Minimum input logic level is about 50 percent higher than that required by the circuit in Fig. 7B, however. A power-gated or buffered-input latch circuit is shown in Fig. 8B. A virtue of this circuit is that, with light loading, it will trigger reliably from one state to the other with an input current as low as a few microamperes. For a minimum-load setup, input resistors R can have a value as high as 500,000 ohms. It is important to note, however, that input logic level must be about 3 volts. Input current is exchanged for input voltage in this setup. The "high-step" input can help to improve noise immunity. You can assemble a power-gated latch using a pair of inverters in a hex-inverter integrated circuit, or you can breadboard the whole circuit with four transistors as shown in the schematic diagram. You should use this circuit whenever you have a sufficient input-logic voltage level but inadequate input-logic current to operate a more common latch. Do not attempt to get around the higher input logic level requirement by using a germanium transistor for triggering. Leakage current through a germanium transistor is too great for this application. The fan-in of the circuit if Fig. 8B is so low that, when used in the majority of digital logic layouts, it can be considered as practically an open circuit. It is especially useful as an exceptionally low-power input start/stop switch in counter and time-lapse applications. An element which can supply the OR logic function and the AND logic function of two inputs simultaneously is of considerable value in digital circuitry. For one thing, with only slight modification, it forms the foundation for an Exclusive OR, or Half-Adder, element. In the simultaneous AND/OR gate of Fig. 9, five diodes and four one-input gates perform all of the required logic functions. At the output of the two input inverters, one pair of the diodes provides the AND function, while the other pair, together with the 1500-ohm resistor, provides the OR function. A logic 1 is obtained at the OR output when a logic 1 is applied to input 1, input 2, or both inputs simultaneously. A logic 1 is obtained at the AND output only when a logic 1 is applied to both inputs simultaneously. A state table for the circuit is also provided in Fig. 9. This state table lists all possible in-puts to a digital logic element or device and the outputs which result from these inputs. In the circuit in Fig. 10, the Exclusive OR output is the SUM output, and the AND output is the CARRY. As shown by the state table in Fig. 10, the circuit provides a logic 1 at the SUM: output when a logic 1 is supplied to either - but not both simultaneously - input. When a logic 1 is supplied to input 1 and input 2 simultaneously, the output is a logic 0, as it is when both inputs are logic 0. The outputs of the circuit demonstrate the fact that a logic 1 added to a logic 0, or vice versa, produces a sum of 1 and a carry of 0. A logic 1 added to a logic 1 produces a sum of 0 and a carry of 1. Now, if we label input 1 with an A and input 2 with a B, then in a half-adder/subtracter in which B is subtracted from A, the following happens: First, the SUM output is identical with the DIFFERENCE output, such that the SUM or DIFFERENCE output supplies the Exclusive A OR B function. Next, the CARRY output supplies the A AND B function. And, finally, the BORROW output supplies the BAND A-COMPLEMENT function. The circuit of a half-adder/subtracter, which can be readily breadboarded, is given in Fig. 11. It consists of five diodes, four inverters, and a dual two-input gate (or the equivalent in discrete form). 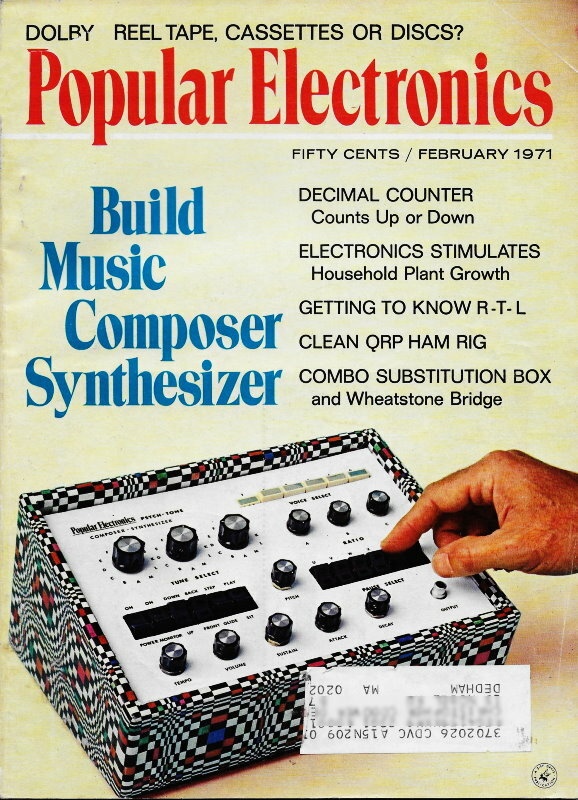 This particular setup also supplies the complement of the SUM or DIFFERENCE output. As you can see from the preceding, there is little need - or reason - for you to make a large financial investment in digital IC's if you want to experiment with and design logic elements and systems. Discrete components, and maybe a few commonly used gate IC's, will suffice for your breadboarding arrangements. You can select your IC's from the knowledge you gain through experimenting with discrete component elements. This is really the best and safest route to go when experimenting with integrated circuit digital logic techniques. 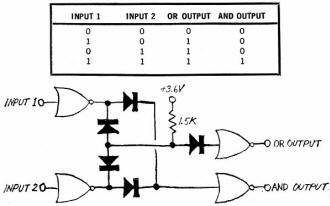 Adder: Switching circuit that combines binary information to generate the SUM and CARRY of this information. AND: This Boolean logic expression is used to identify the logic operation where, given two or more variables, all must be logic 1 for the result to be a logic 1. DTL (Diode-Transistor Logic): Logic is performed by diodes with transistors used only as inverting amplifiers. Exclusive OR: A logic function whose output is 1 if either of the two input variables is 1 but whose output is 0 if both inputs are 1 or 0. Fan-in: A figure denoting the input power required to drive a logic element satisfactorily. Fan-out: A figure denoting the power output of a logic element with respect to logic element inputs. 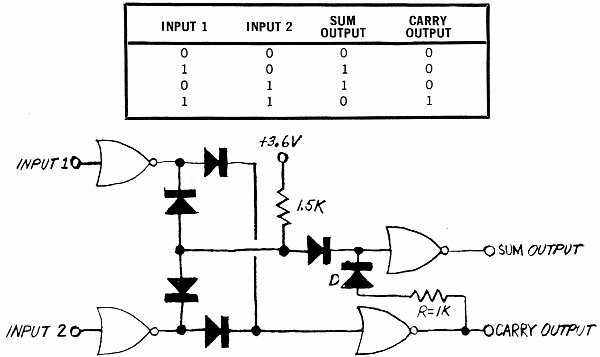 AND Gate: All inputs must have 1-level signals at the input to produce a 1-level output. NAND GATE: All inputs must have 1-level signals at the input to produce a 0-level output. 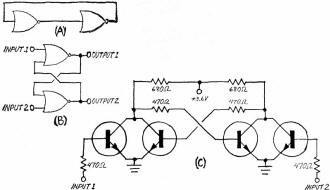 NOR Gate: Anyone input or more than one input having a 1-level signal will produce a 0-level output. 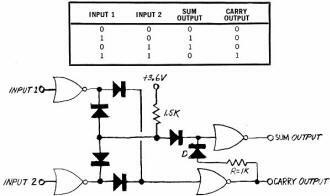 OR Gate: Anyone input or more than one input having a 1-level input will produce a 1-level output. 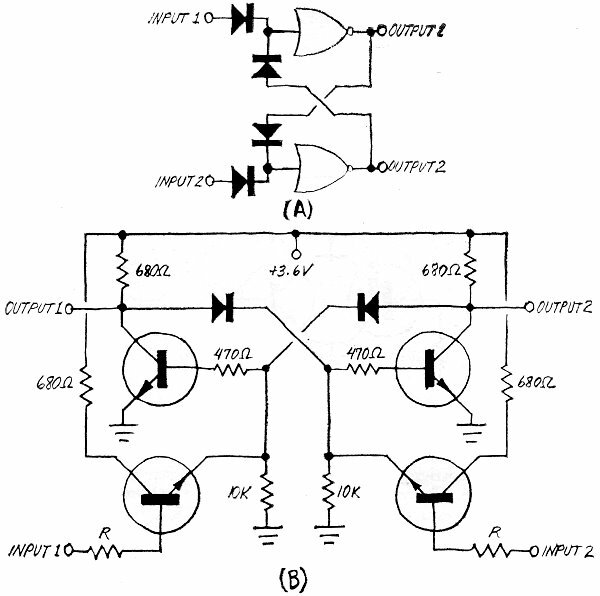 Half Adder: A switching circuit which combines binary information to generate the SUM and CARRY. It can accept only the two binary bits to be added. Negative Logic: Logic in which the more negative voltage represents the 1-state; the less negative voltage represents the 0-state. Noise Immunity: A measure of the sensitivity of a logic circuit to triggering or reaction to spurious or undesirable electrical signals or noise, largely determined by the signal swing of the logic. RTL (Resistor-Transistor Logic): Logic is performed by resistors. Transistors are used to produce an inverted output. 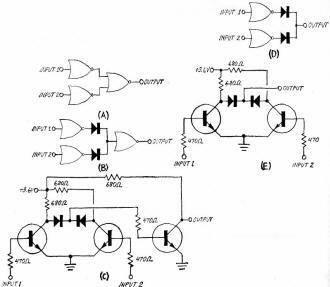 TTL, T2L (Transistor-Transistor Logic): A logic system evolved from Diode-Transistor Logic in which the diode cluster is replaced by a multiple-emitter transistor.